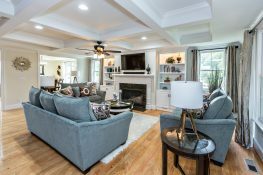 New Homes For Sale By Sadler Building Corp.
Home » Featured Builders » Sadler Building Corp.
Sadler Homes was recently selected as a member of the Southern Living® Custom Builder Program for the Hampton Roads area. Southern Living® carefully selects custom home builders that transcend the pages of the magazine into a dream home. Members are chosen for their extensive experience and knowledge, reputation in the marketplace, and focus on the discriminating customer who is looking to build a custom home. Each home features a unique display of design, style and craftsmanship. With a conscientious and experienced staff, Sadler prides themselves in delivering distinctive homes recognized for their quality and value. Sadler Homes’ promise is to build a quality home that you and your family will enjoy for years to come! Check out their 2010 Homearama Model Home, the Armistead.